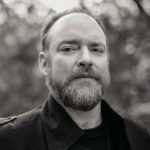 On April 21, 2018 when music enthusiasts flocked to record stores in honor of “Record Store Day,” fans of John Carter Cash (pictured, below) had the opportunity to pick up Cash’s new album, We Must Believe In Magic. The 17-track release is a collection of songs recorded over the last ten years and features an astounding host of musical guests, including some of Nashville’s most recorded session players and artists representing Rock, Gospel and Country Music. Tony Rice, Ana Cristina Cash, John Cowan, The Fisk Jubilee Singers, Jerry Douglas, Dave Roe, The Daeger Brothers, Bob Moore, Etta Britt, Charlie McCoy, Tony Harrell, Jamie Hartford, Sam Bush, Jack Clift and the Cedar Hill Refugees, Sarah Peasall McGuffey, Ira Dean, Ronnie and Rob McCoury, Eric Hamilton and many others took part in the project. The album’s imaginative cover features the faces of many of the individuals who contributed to the music and is designed by Roberto Parada. The project is made up of original material, some co-written with master songwriters, including Bill Miller, Shawn Camp, and Wesley Orbison. A remake of Trent Reznor’s “Hurt,” previously released by Cash’s father is also a highlight on the release. Much of the production is sparse and simple, focusing on the song and the individual instrumentalist. John Carter holds no limit or containment around his creative energy, and the double-album promises to be diverse and presents an unparalleled epic journey. Released through Reviver Legacy, the full-length album is produced by John Carter Cash and was engineered and mixed by Chuck Turner at Cash Cabin Studios in Hendersonville, Tennessee, where John Carter worked with his parents Johnny Cashand June Carter Cash on much of their latter life recordings. Growing up among one of Country music’s most recognizable families, there’s no surprise that John Carter Cash would mature to become an accomplished and award-winning record producer. Having been a producer for over 25 years now, he’s garnered six Grammy Awards and seven Grammy nominations, and has production credits that includes Alison Krauss and Union Station, Chris Cornell, Elvis Costello, John Cowan, Rodney Crowell, Sheryl Crow, Brooks & Dunn, Vince Gill, Carlene Carter, Emmylou Harris, George Jones, Kris Kristofferson, Loretta Lynn, Rosanne Cash, John McEuen, Mighty Clouds of Joy, Jamey Johnson, John Popper, Ruston Kelly, Kacey Musgraves, Willie Nelson, The Nitty Gritty Dirt Band, Tim O’Brien, John Prine, Earl and Randy Scruggs, Ralph Stanley, Josh Turner, Dr. Mavis Staples, The John Randal and Jessi Alexander, Wylie and the Wild West, to many more. Having written music for decades, John Carter continues to live inside a creative world reaching far beyond just music production. He is a singer-songwriter and author. The grandson of Maybelle Carter and the only son from the marriage of John R. Cash and June Carter Cash, he preserves the family legacy and is a caretaker to the heritage of his musical ancestors. For press inquiries, contact Christy Walker-Watkins at 615-269-7071 or christy@aristomedia.com.